The following are excerpts from the final book written by the late Father Gabriele Amorth, who died September 16 at the age of 91. 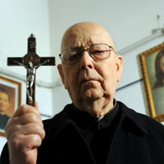 Father Amorth had served as official exorcist for the Diocese of Rome. Thanks to Sophia Institute Press for permitting me to publish these excerpts in my column. 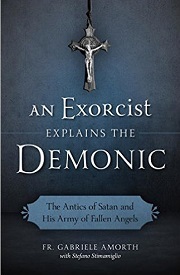 Click here to order a copy of An Exorcist Explains the Demonic: The Antics of Satan and His Army of Fallen Angels. It is also necessary to have a well-formed conscience. A good conscience is not achieved by elevating oneself or, worse yet, allowing the dominant culture to arbitrate good and bad. A good conscience is obtained by conforming one's will to God's will and to His teachings, which are given to us for our happiness and our salvation and are summarized in the highest degree in the Commandments. Without a doubt, diabolical possession, the invincible influence of the devil on a person, is the most striking and serious form of the extraordinary action of the devil. When the demon is able to take possession of a person, he can make him say and do what he wishes. It is necessary to clarify that the devil is not able to take possession of the soul of a man (unless the person expressly consents to it), but only his body. Nevertheless, I must say that the cases of valid and true possession are rare: cases of vexation, obsession, and infestation, which I shall treat further on, are more frequent. Diabolical vexations are the second type of the demon's extraordinary spiritual aggression and are far and away the most numerous. They are caused by a person's cultivation of imprudent habits; by frequenting wizards or séances, through repeated and persistent serious sins, or by submitting to spells. 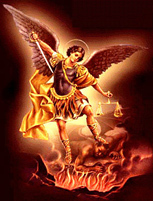 Here the devil acts without any dominant and prevailing influence over the body and the mind of the victim, as happens in the case of possession. We have spoken of evil spells: possession, vexation, obsession, and infestation. Now the question arises: Why does God permit evil? First, it is necessary to make clear that God, being infinite love, does not wish evil. He simply permits it, because He created men and angels as free creatures. Simply put, men are free to choose whether they wish to live for God or against Him and therefore to opt for heaven or for hell. We must recognize that God has made everything to make man happy, and in accordance with this plan, God asks man to obey the laws that He has established; but God has also given man the ability to refuse this truth. This is the situation in which all of us are placed. And here we are before a great mystery: that creatures freely choose evil rather than good. It was the case of Joseph, a youth of twenty-eight, who emanated a strong odor of smoke and who used and sold drugs and cursed. I could see immediately that he came to me solely to please his mother and his sister, who accompanied him. I had just begun to pray when the demon manifested itself immediately and violently, and I had to stop. When [Joseph] recovered, after the exorcism, I told him that he was possessed. He told me that he already knew that he was demoniac and that he was fine with it. I never saw him again. This is the greatest risk that God has taken with His creatures, angels and men. And He has taken it for a simple reason: because without free will, that is, without the possibility of choosing between good and bad, we would be robots and not totally free creatures. Liberty – infinite in God – is a sign of our greatness and of our sonship in Jesus Christ. Without it, we could not call ourselves sons, but only slaves. There are also blameless causes, which are decidedly the majority of the cases. In fact, I think that at least 90 percent of the cases of possessions and of other evil spells are directly attributable not to their victims but to those persons who have turned their particular attentions on them, practicing some spells or evil eye against them for various motives, such as resentment, hatred, or vendetta.